John Moran Auctioneers is heading into fall with an extraordinary lineup of auctions, starting with the October 2nd Traditional Collector catalogue featuring 300 lots of Continental, American and Asian decorative arts, clocks, furniture and artwork. Many intriguing selections hail from the estate of life-long collector Harry J. O’Connor III, whose celebrated collection of clocks has been filtered throughout Moran’s Continental-themed auctions all year. 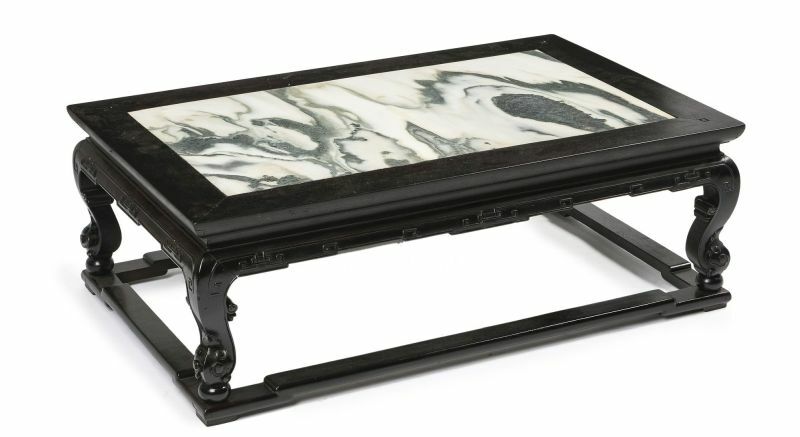 Objects from the O’Connor collection include a mid-20th century Chinese marble-top tea table crafted from highly desirable zitan wood. The low-profile table carries a conservative $8000/12,000 estimate, but is expected to pique the interest of many serious collectors. A French Empire gilt bronze-mounted portico clock dating to the turn of the 19th century is also expected to stir up bidder interest; featuring a handsome white and black marble case, the clock is expected to earn between $3000 and $5000. A second Empire clock from the O’Connor estate, this example rendered in gilt bronze and surmounted by a putto placing a crown atop the head of Empress Josephine, has been assigned a $2000/3000 estimate. Those in search of elevated lighting fixtures should look no further; the estate has also proffered four Baccarat “Crinoline” crystal and gilt-bronze sconces ($1000/1500). A number of gorgeous silver selections grace the Traditional Collector catalogue; a handsome Italian .800 silver tea service with galleried tray by maker Pampaloni Ermindo di Pampaloni Franco has been assigned a conservative $2000/3000 estimate. A George III sterling silver tureen by important London silversmith Paul Storr has also been consigned to Moran’s October auction. A rather muted example of Storr’s Neoclassical style, the covered tureen features lion-headed paw feet, and will head to the block with a $8000 to $12,000 estimate. An American silver pitcher by Baltimore silversmiths Jaocobi and Jenkins featuring the makers’ signature dense repousse floral decoration is expected to find a buyer for between $3000 and $4000. Sculptures range from bronzes by well-known makers to highly detailed carved marble compositions. Ephraim Keyser’s (1850-1937 Baltimore, MD) gorgeously finished bronze sculpture of the fairy queen “Titania” atop a leaf-form chariot pulled by squirrels carries a $7000/9000 auction estimate. Expected to bring between $3000 and $5000, a figural bronze sculpture of a male and female farmer during the wheat harvest is listed after the original by Adrien Etienne Gaudez (1845-1902 French). A charming large-scale alabaster sculpture by Italian artist Romano Scheggi (1888-1966) is exceptionally well-modeled; titled “Fisherboy”, the sculpture is expected to earn $6000/9000. Continental and American works of art are well represented throughout the Traditional Collector catalogue; one standout highlight is George Cochran Lambdin’s (1830-1896 Philadelphia, PA) “Flowers”, dating to 1859. The sweet portrait of a girl with a bouquet of flowers is expected to earn $5000 to $7000 at the October Traditional Collector Auction. An impressive large-scale portrait of a woman, “Baronin Wilhelmine Mylius”, by Austrian painter Friedrich von Amerling (1803-1887), is slated to head to the block with a $12,000/$18,000 estimate. “Baronin Wilhelmine Mylius” has been reviewed by Dr. Sabine Grabner of the Belvedere Museum Vienna, and will be included in the artist’s catalogue raisonné. Juliaan de Vriendt’s (1842-1935 Belgian) oil painting of women in a church interior waiting for devotion is expected to bring $8000/$12,000. A hand-painted Rene Lalique “Inseparables” opalescent art glass clock featuring molded decoration of parrots and flowering branches will head to the block with a $2000/3000 estimate. A French automaton featuring two caged singing birds will make a delightful addition to any collection, and carries a $3000/4000 estimate. A pair of Chinese wood and cloisonné enamel ruyi scepters dating to the turn of the 20th century hail from the Estate of Nancy Chandler (estimate: $1200/1800). A collection of fine contemporary furniture and accessories by well-known luxury designer Provasi has been consigned from a private southern California collection; selections include seating, a gilt bronze-mounted commode, a silk upholstered daybed, and more, all offered with conservative estimates. All of John Moran Auctioneers’ auctions and special events take place at their headquarters in Old Town Monrovia: 145 E. Walnut Ave., Monrovia, CA 91016. Free public preview is scheduled for Friday, September 28th from 10am to 4pm; Saturday, September 29th from 12pm to 4pm; Sunday, September 30th from 12pm to 4pm; Monday, October 1st from 10am to 4pm; and on Tuesday, October 2nd, the day of the auction, starting at 10am. The auction will start promptly at 3pm. The fully illustrated catalogue will be live online by September 18th, and bidding will be available via the Liveauctioneers, Auctionzip and Invaluable online platforms, as well as in person and via absentee and telephone bid. John Moran Auctioneers has already set their auction calendar for the remainder of 2018. Upcoming events include: October 23rd California & American Fine Art and Women in Art auctions, November 13th Prints & Multiples and 20th Century Design auctions, December 11th Fine Jewelry and Timepieces and Studio Jewelry auctions, and December 12th Art of the American West and Turn of the Century Design auctions.